Crytek and Microsoft Studios recently announced the launch of a public beta for Warface Xbox 360 Edition. Fans of the free-to-play online first-person shooter can be among the first to experience the co-operative and competitive multiplayer action on Xbox 360, leading up to the game’s launch this Spring. Powered by the award-winning Cryengine, Warface Xbox 360 Edition boasts gameplay set in the near future where Warface forces battle against the ruthless Blackwood military. 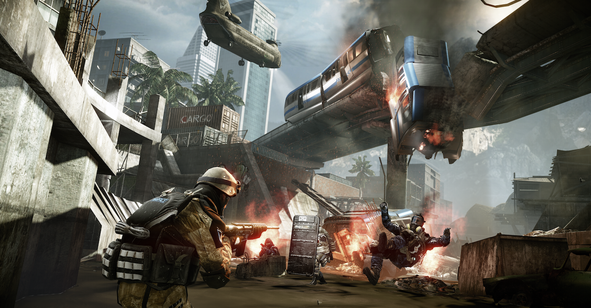 The class-based shooter enables beta players to experience different tactical approaches, gameplay styles and unique weapon sets of all four Warface classes: Rifleman, Medic, Engineer, and Sniper. When the game launches in Spring, players will then receive regularly updated content, enabling fans to experience new, daily co-operative campaign missions and a continuous supply of new maps, weaponry, boosts and more. Crytek today also unveiled a new trailer showcasing the game’s four solider classes and co-operative gameplay on Xbox 360 for the first time. The game will be available exclusively on Xbox 360 as a free-to-play with Gold title. Visit www.warface.com/xbox to sign up.